This soup is incredible this time of year, allowing you to use up the last of the summer produce in a delicious, warming way. The last of the true, seasonal tomatoes will only be available for the next few weeks and this is a great way to use up the last few in your garden or at the farmer’s market. This makes a big batch which I like to divide, eating half for dinner, and freezing half for a busy day. If you decide to do this, reserve your half for freezing before you add your cream. Once defrosted, add your cream and re-heat slowly. Preheat your oven to 400•. 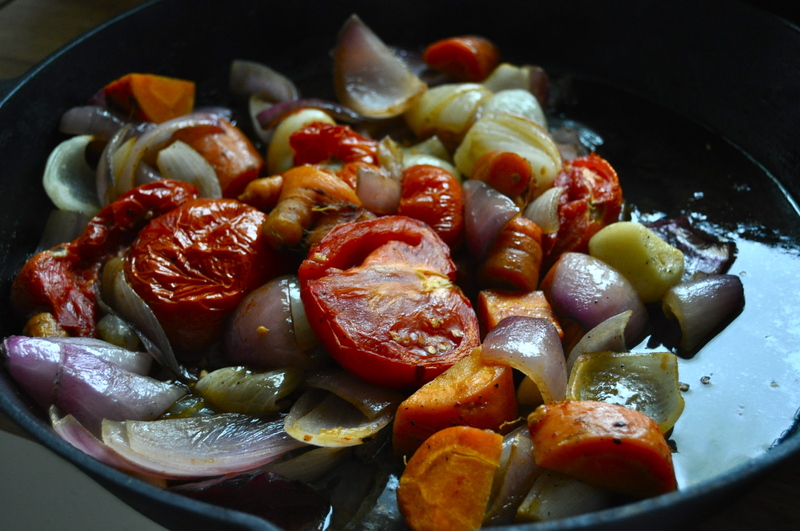 Halve your tomatoes, onions, carrots, and garlic cloves. Toss with the oil and a generous pinch of both salt and pepper. Place on your baking pan in a single layer (if you have cast iron, use it now <3) Roast until your veggies are golden and beginning to caramelize. Scrape into a large pot, making sure to get all the juices and the browned bits stuck to the bottom of the baking pan. Add vegetable broth and fresh tomatoes. Bring to a boil. Reduce heat to low and simmer for 10 minutes (or longer if you like). Add white wine and allow to simmer for 5 more minutes. 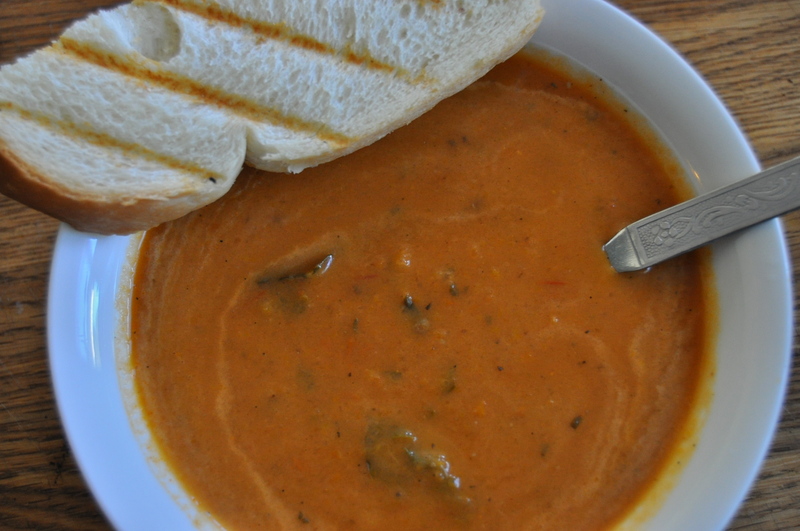 Use an immersion (or regular) blender to puree the soup. Be careful 🙂 Remove from heat. Add your cream and tear in your basil. Taste. Season with salt and pepper until perfect. This entry was posted in main, Soup, vegan, vegetarian and tagged dairy free, easy, gluten free, nut free, soup, soy free, vegan, vegetarian. Bookmark the permalink. I made this over the holiday break; it was awesome! I just added a bit of spice to it to give it a kick :). Please post more soup recipes!